stop/time dance theater is the dance company-in-residence at Playhouse on Park. 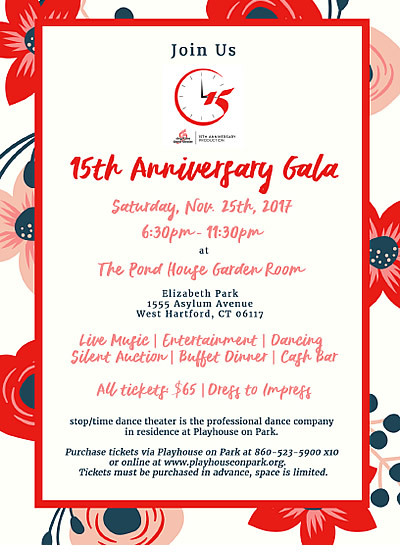 It's their 15th anniversary and you're invited to join in the celebration at the Pond House at Elizabeth Park. Purchase tickets online here, or call the Box Office at 860-523-5900 x10. 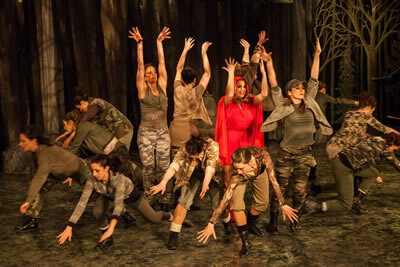 stop/time dance theater started with a dream in 2004. According to founder Darlene Zoller, "Throughout my career, I’d seen wonderful dancers passed over because they weren’t great singers, or they had the wrong hair color, or were too skinny or too curvy or too quiet or too anything! As time moved along, I realized that I had a dream -- a dream in which all dancers are given their due. This dream lead to a show; and that show led to us, a company that truly embodies the term “group effort.” The most precious gift I have received is the unconditional love, dedication and hard work of every person involved. We’re a fledgling company with energy, enthusiasm, an abundance of talent – and each member of this company has their own dream. Who knows where it will all lead?"